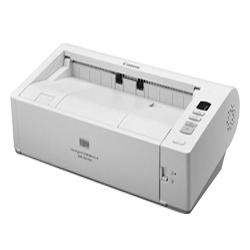 Canon DR-M140 Scanner Make wrestling with paper feeding a thing of the past with this scanner's advanced paper handling features for exceptional performance.Feed and eject documents using only the space in front of the scanner with the U-turn path, or use the straight path to scan cards and thick documents. Switching between the document paths based on document type is quick and easy.Instant one-touch buttons allow jobs to be done easily and effortlessly, even by first-time operators..
Simplex: 200dpi 40 pages/min.300dpi 40 pages/min. Duplex: 200dpi 80 images/min. 300dpi 80 images/min.